Trim chicken breast of all fat and with a meat mallet, lightly pound out to an even thickness, then coat evenly with blackened seasoning. In a very hot cast iron skillet cook the chicken for 1 1/2 to 2 1/2 minutes on each side or until firm yet springy to the touch. Once cooked cut into medium dice. 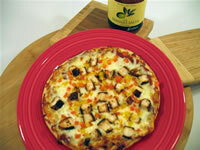 Lay out the 2 pizza crusts and coat the top of each with 3 ounces of Gunther's Gourmet Lime Mango Salsa. Top with mozzarella cheese, blackened chicken cubes, yellow and red peppers. In a preheated 400 degree oven, place the pizzas directly on the oven rack, that has been placed on the middle setting and bake for 10 to 14 minutes or until the cheese is bubbly and starting to turn a golden brown. Remove side muscle from scallops, pat dry and place in a zip lock bag. Coat lightly with olive oil and add the blackened seasoning. Shake gently so as to not damage the scallops but enough to evenly coat each scallop with the blackened seasoning. Cook on each side for 1 to 2 minutes or until nicely seared and just cooked through to the center. Remove from skillet and let rest for a few minutes. 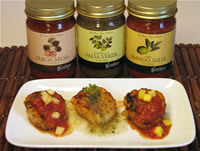 Place three scallops on serving dish and top each with 1 tablespoon of the 3 different salsas (see picture). Garnish with fresh herbs or fresh diced mango and peaches if you have some on hand. 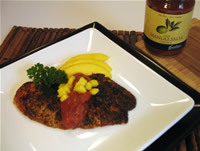 Pat dry the tilapia filets and coat evenly with blackened seasoning - pat on well and shake off excess. In a dry (no oil), very hot cast iron skillet, place tilapia filets skin side down and cook 1. Place fish on desired serving plate and spoon on chilled Gunther. 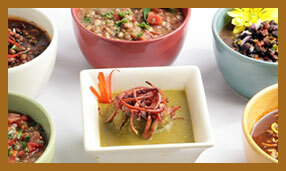 Garnish with chopped parsley and diced mangos. *Note - the tilapia can be substituted with tuna, swordfish, red fish or any other fish you blackened. 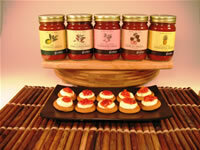 Bring cheese to room temperature so it's easy to pipe or spread. While oven is heating, trim pork tenderloin of all fat and silver skin. Place trimmed tenderloin in a zip locked bag and add jerk seasoning, shake bag well so the meat is evenly coated with seasoning. Place pork on a cooking rack and place that on top of a sheet tray, and put in a 400 degree oven. Cook for 5 1/2 to 6 minutes per pound or until internal temperature reaches 140 - 145 degrees. Remove from oven and let rest for 5 minutes, then slice into 1/4 to 1/2 inch pieces.